Diameter 4 cm (1 1/2'') 12 v Centrifugel (1/2'') diameter hose tail. Foot mounting plate. 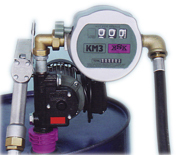 Pump is IP54 fordoor use. Thew same pump wi8lll work on either a 12V or 24V battery. Robust self priming vane pumping unit for use with diesel. The Vision standard duty diesel pump has the latest cabinet desig. Mechanical display reset. 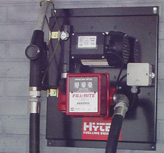 Nozzle operated on/off switch ( micro Switch Type) Nozzle can be padlocked to prevent unauthorised.